It's Leo Szilard's birthday today. A couple of years ago historian Bill Lanouette brought out a new revised edition of his authoritative, sensitive and sparkling biography of Szilard. It is essential reading for those who want to understand the nature of science, both as an abstract flight into the deep secrets of nature and a practical tool that can be wielded for humanity's salvation and destruction. As I read the book and pondered Szilard's life I realized that the twentieth century Hungarian would have been right at home in the twenty-first. More than anything else, what makes Szilard remarkable is how prophetically his visions have played out since his death in 1962, all the way to the year 2016. But Szilard was also the quintessential example of a multifaceted individual. If you look at the essential events of the man's life you can see several Szilards, each of whom holds great relevance for the modern world. Later during the 1930s, after he was done campaigning on behalf of expelled Jewish scientists and saw visions of neutrons branching out and releasing prodigious amounts of energy, Szilard performed some of the earliest experiments in the United States demonstrating fission. And while he famously disdained getting his hands dirty, he played a key role in helping Enrico Fermi set up the world's first nuclear reactor. When Fermi was building the reactor his experiments were plagued by graphite moderator containing impurities of boron which absorbed neutrons and slowed down the reaction; with his background in engineering and his business connections, Szilard found a chemical engineering firm which supplied high purity graphite. Interestingly, the Germans encountered the same problem but instead of getting around it they got dissuaded and decided to use heavy water as a moderator instead. This led to them depending on the heavy water facility at Vemork in Norway; that facility was destroyed by the Allies in 1943, consigning the German atomic bomb effort to a certain end. He also excelled at what we today called networking. Szilard's networking abilities were evident in his connections with prominent financiers and bankers who he constantly tried to conscript in supporting his scientific and political adventures; in attaining his goals he would not hesitate to write any letter, ring any doorbell, ask for any amount of money, travel to any land and generally try to use all means at his disposal to secure support from the right authorities. In his case the "right authorities" ranged, at various times in his life, from top scientists to bankers to a Secretary of State (James Byrnes), a President of the United States (FDR) and a Premier of the Soviet Union (Nikita Khrushchev). Interestingly Szilard also became an early confidant of financier (and future Oppenheimer nemesis) Lewis Strauss who he convinced to fund and support his projects; later when the vindictive Strauss turned against Oppenheimer Szilard repudiated his advances. If Szilard had accomplished his scientific milestones and nothing more he would already have been a notable name in twentieth century science. But more than almost any other scientist of his time Szilard was also imbued with an intense desire to engage himself politically - "save the world" as he put it - from an early age. Among other scientists of his time, only Niels Bohr came closest to exhibiting the same kind of genuine and passionate concern for the social consequences of science that Szilard did. 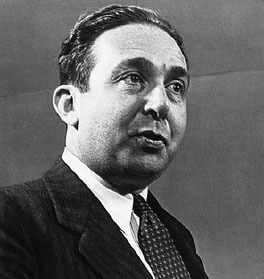 This was Leo Szilard the political activist. Even in his teens, when the Great War had not even broken out, he could see how the geopolitical landscape of Europe would change, how Russia would "lose" even if it won the war. When Hitler came to power in 1933 and others were not yet taking him seriously Szilard was one of the few scientists who foresaw the horrific legacy that this madman would bequeath Europe. This realization was what prompted him to help Jewish scientists find jobs in the UK, at about the same time that he also had his prophetic vision at the traffic light. It was during the war that Szilard's striking role as conscientious political advocate became clear. He famously alerted Einstein to the implications of fission - at this point in time (July 1939) Szilard and his fellow Hungarian expatriates were probably the only scientists who clearly saw the danger - and helped Einstein draft the now iconic letter to President Roosevelt. Einstein's name remains attached to the letter, Szilard's is often sidelined; a recent article about the letter from the Institute for Advanced study on my Facebook mentioned the former but not the latter. Without Szilard the bomb would have certainly been built, but the letter may never have been written and the beginnings of fission research in the US may have been delayed. When he was invited to join the Manhattan Project Szilard snubbed the invitation, declaring that anyone who went to Los Alamos would go crazy. He did remain connected to the project through the Met Lab in Chicago, however. In the process he drove Manhattan Project security up the wall through his rejection of compartmentalization; throughout his life Szilard had been - in the words of the biologist Jacques Monod - "as generous with his ideas as a Maori chief with his wives" and he favored open and honest scientific inquiry; this aspect of Szilard’s scientific philosophy would have been acutely appreciated by many modern scientists who favor open-access publication and collaborative, crowdsourced science. At one point General Groves who was the head of the project even wrote a letter to Secretary of War Henry Stimson asking the secretary to consider incarcerating Szilard; Stimson who was a wise and humane man - he later took ancient and sacred Kyoto off Groves's atomic bomb target list - refused. Szilard's day in the sun came when he circulated a petition directed toward the president and signed by 70 scientists advocating a demonstration of the bomb to the Japanese and an attempt at cooperation in the field of atomic energy with the Soviets. This was activist Leo Szilard at his best. Groves was livid, Oppenheimer - who by now had tasted power and was an establishment man - was deeply hesitant and the petition was stashed away in a safe until after the war. Szilard's disappointment that his advice was not heeded turned to even bigger concern after the war when he witnessed the arms race between the two superpowers. In 1949 he wrote a remarkable fictitious story titled 'My Trial As A War Criminal' in which he imagined what would have happened had the United States lost the war to the Soviets; Szilard's point was that in participating in the creation of nuclear weapons, American scientists were no less or more complicit than their Russian counterparts. Szilard's take on the matter raised valuable questions about the moral responsibility of scientists, an issue that we are grappling with even today. The story played a small part in inspiring Soviet physicist Andrei Sakharov in his campaign for nuclear disarmament. Szilard also helped organize the Pugwash Conferences for disarmament, gave talks around the world on nuclear weapons, and met with Nikita Khrushchev in Manhattan in 1960; the result of this amiable meeting was both the gift of a Schick razor to Khrushchev and, more importantly, Khrushchev agreeing with Szilard's suggestion that a telephone hot-line be installed between Moscow and Washington for emergencies. The significance of this hot line was acutely highlighted by the 1962 Cuban missile crisis. Sadly Szilard's later two attempts at meeting with Khrushchev failed. Since Szilard the common and deep roots that underlie the tree of science and politics have become far clearer. Today we need scientists like Szilard to stand up for science every time a scientific issue such as climate change or evolution collides with politics. When Szilard pushed scientists to get involved in politics it may have looked like an anomaly, but today we are struggling with very similar issues. As in many of his other actions, Szilard's motto for the interaction of science with politics was one of accommodation. He was always an ardent believer in the common goals that human beings seek, irrespective of the divergent beliefs that they may hold. He was also an exemplar of combining thought with action, projecting an ideal meld of the idealist and the realist. Whether he was balancing thermodynamic thoughts with refrigeration concerns or following up political idealism with letters to prominent politicians, he taught us all how to both think and do. As interdisciplinary scientist, as astute technological inventor, as conscientious political activist, as a troublemaker of the best kind, Leo Szilard leaves us with an outstanding role model and an enduring legacy. It is up to us to fill his shoes. This is a revised version of a past post.